through every crease, every congregation of wrinkles. and suncats danced their reflections in the clothes tub. as it adjusted its facets and corners. and the straining groan of the iron handle turning. and the parts of her hidden by clothes. Poem by CB Follett from "And Freddie Was My Darling." that they needed to be. Follett's poems are supple and poignant. They radiate with a kind of innocence the world has lost. This book will make you laugh and cry--sometimes at the same time. It will surprise you into remembering the wild, silly, yearning person you used to be. Read it. 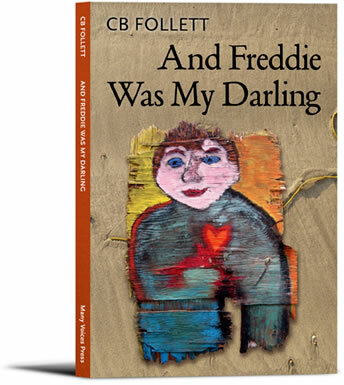 Like a superb ballad made up of unraveling verses, each chronicling a girl's coming of age, CB Follett's utterly charming and often heart-breaking new book, And Freddie Was My Darling, reminds us that of all passages in one's life, the passage into sexuality and young adulthood is the most exciting and the most disorienting as well.